… then today’s best countries might be in Northern Europe. According to my research (as well as others‘), the king’s capital of Atlantis was Basileia, located in what’s now Northern Europe… so it makes sense that advanced principles of society-building might emerge near the center of that late, great empire. 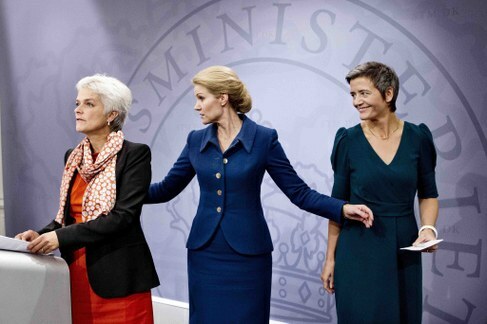 The leaders of Denmark’s three political parties are women. 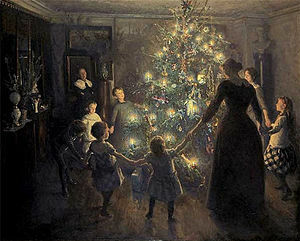 The Danish culture of hygge really comes alive at Christmas. 6) A sense of collective responsibility, belonging, and service to others that’s become culturally ingrained as well as legislated. Number 6 is especially important. The sense of belonging and service to others can be the greatest source of peace within us, within our communities, and throughout our world. Desire to serve is the most natural condition for the finer human spirit residing within… the living spark that guides us to paradise after we die. When intimate kinship emanates outward into the workings of families, companies, and governments, peace and contentment prevail. Sadly, here in the USA the division between rich and poor has grown to historic proportions, which has strained the sense of belonging to the breaking point. While 25% of Americans struggle to afford food, and 25% of American children live in poverty, rich Americans have become obsessed with increasing and protecting their wealth by wielding political and industrial power. They lobby bitterly against free health care and education for Americans, fearful that such generosities would cut into their wealth. In these troubled American times you’d think that the poor would be more inclined than the rich to cheat and steal, just to survive… but in fact the opposite seems to be true. The wealthy are more inclined to break laws to protect their wealth. As fear and greed drive the wealthy away from compassion toward further repression of the poor, the desire to redistribute wealth grows stronger and stronger among the less advantaged… and it becomes the proverbial vicious cycle. If the Danes are the happiest country in the world, it’s because they take care of their people. The USA has become an unhappy place in recent years, largely because the rich take care of themselves by taking control of government and industry… and the swelling ranks of poor are neglected. So, how to solve the crisis here in the States? Maybe we could learn something from Northern Europe. The Swiss enjoy a hands-on democracy in which a revolutionary idea, signed by only 100,000 petitioners, can be put to a national vote. This month they’ll vote on a “fat-cat” initiative in which CEO salaries will be limited to 12 times the salary of the lowest-paid employee. If passed, the new law would put an end to an era of obscene personal windfalls enjoyed by industry leaders… at least in Switzerland. Another, even more radical petition was submitted last month with 100,000 signatures: Every Swiss adult—rich or poor, employed or out of work, married or single, homeowner or renter or homeless… everyone would receive an unconditional basic income of $2,500 Swiss francs per month (about $2,800 US dollars). One-third of Swiss GDP would go to the public’s basic income… and most of it would quickly be recycled back into the economy through purchases. A date hasn’t yet been set to vote on the Basic Income initiative in Switzerland, but if it passes, it’ll usher in a new era of democracy that is (arguably) well suited to the modern age in which most work has become automated. The basic income would guarantee the chance of a modest life style for everyone in Switzerland. At best, a basic income, were it to spread worldwide, could usher in the Golden Age of this Second Epoch of humanity. People at last would be free to pursue their greatest dreams. Genius and creativity would flourish. Many experts feel that the initiative is too radical and the chance of its passage is slim, even in Northern Europe. In any case, Switzerland with its Basic Income idea is certainly the country to watch in the coming months. Ylvis is a comedy duo from Bergen, Norway consisting of brothers Vegard and Bård Ylvisåker. Written and filmed for the talk show, their song and music video “The Fox (What Does the Fox Say? )” went viral on YouTube in September 2013 with over 275 million views to date, bringing the brothers to international attention. This entry was posted in After we die, what then?, Our ancient heritage, Our paradise destiny, Politics and Economics, Society and ethics and tagged atlantis today, denmark happiest country, gap between rich and poor, hygge, redistribution of wealth, Swiss basic income initiative. Bookmark the permalink. Very nice Mark. I am sure that Paradise realms are a grander extension of what the Danes enjoy. Your post has refreshed me! I suspect so too, John. In fact, the reports from Timestream spirit group over the years do indeed sound like that kind of community in which people feel concern for each other. Your post actually got me thinking about moving to Denmark if I were to pick up and move again. I have been there and it is special. On the other hand, since Paradise, or Life after Life, bests Denmark, then I shall gladly wait until I slip the veil, and just go live there! No overseas travel, no moving vans, no more worries about what Jesus said in Matthew 6:19-21!!!! We won’t be prepared to die, or accept its various forms in others’ lives, until we have truly lived. People who have experienced life intensely and fully are the ones who are most able to let go of it. They can die with the same passion with which they lived. Those who fear passing on the most are those who sense that they have not fully lived or they have held back from achieving their dreams because fear overrides. Fear stops our progress across the threshold of adventure and we do not easily venture out of the comfort zone. Those who have pursued a full life have learned already how to include “death,” and so death is not such an unknown for them. I sometimes think of moving to another country, but as long as there’s hope for keeping the States vital and the people really United, there’s really nowhere I’d rather live until it’s time to move on the the next world. Till then, there’s still a lot of adventure, joy and suffering to experience in this world, a growing collection of memories to take along to paradise. I completely agree that the most important and core item of focus here is to promote a sense of concern for one another. While the current antipathy seems to be a product of our societal structure, I truly believe that Hollywood has led the collective consciousness of our country down a very dark path. I yearn for the rise of a media powerhouse that successfully finds a way to promote goodwill among mankind – one that will assist in ushering in an era with more light. It is only through constant exposure to this light consciousness that we can all begin to find our way towards that better world – a world that would become more deeply fulfilling on a spiritual level that most people can’t possibly fathom at this time. Through this channel, the ethereal realms can finally call Earth a world that’s worth having a relationship with. We will become a true beacon in our Universe. These are my thoughts. But I think I am preaching to the choir! Ricky, it’s a message the choir always enjoys! Hollywood certainly has led the charge into the dark in recent decades, and it kind of amazes me how much our savage side enjoys that ride. Scriptwriters, producers, and directors who can master the art of weaving a noble theme (good will and our oneness at our innermost level) into a convincing and gripping drama will win accolades from many realms………….